Photos from camp are now posted (links below). They are organized by camp actvity, and you can browse photos, slideshows, download hi-res copies, and order prints online. Site 4 this year was “Acadia,” the first national park east of the Mississippi River, off the coast of Maine. The Passamaquoddy tribes were among the first inhabitants of Acadia, and campers learned about these hunter-gatherers and their everyday life. Campers brainstormed how they would use the stone tools, birch bark, cedar cuttings and grasses, and wampum necklaces made from hand painted purple beads were strung on raffia. Much of Acadia’s land was a summer playground for the east coast wealthy. John D. Rockefeller, Jr had a summer home and worked with the Civilian Conservation Corps to develop over 45 miles of paver carriage roadways. We had our version of the Corps and campers designed and laid their own paver walkway. As one of the nations’ top potato producers, the Maine potato bar was featured as Acadia’s snack. The famous lighthouses of the Maine coastline helped set the scene at the Lighthouse Snack Shop. Campers were treated to warm, creamy bowls of mashed potatoes and could top them with a variety of goodies. They also enjoyed ”blueberry pie” Pop Tarts and cold cranberry juice in honor of two of Maine’s other popular edible exports. Lighthouse tenders and their wives spent lonely times on the craggy coasts of the island. To pass the time, many quilted and worked on scrimshaw. Both of these centuries old crafts were offered at Acadia’s craft site. Campers received craft boxes with a quilt square and complete sewing instructions. They also had a chance to try a soap version of scrimshaw and took home their completed masterpieces to share with family and friends. Denali National Park, Site 5, is one of ten national parks in Alaska. The site boasted a rock climbing wall for the bravest of campers to scale our version of Mt. McKinley! 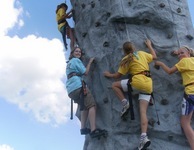 With expert guidance from Three Rivers Parks staff, many campers experienced the climb of their lives! They also tried many native Alaskan children’s games and their histories. 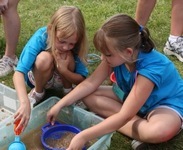 The Klondike Gold Rush was an activity enjoyed by all. The Last Frontier way of life was and adventure back in time. An authentic dog sled and panning for gold added to the excitement of the Denali area. All the gold diggers enjoyed a delicious salmon spread on bread and a Miner’s Ice Cream Sundae…creamy, cold and complete with gold (butterscotch) nuggets. History and personal stories can be told in word as well as picture. 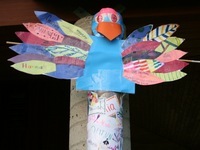 Each camper at Twilight Camp learned the symbolism of totem pole art. They chose the animals that represented important facets of their lives and created their own work of art to take home. Units also added to larger totem poles which were displayed on site during the week of camp. Did you know Minnesota’s only national park is also the only one without an official roadway system? Voyageurs National Park, Site 3, was the place for the outdoor lover in each of us. Both current and historic ways of life were featured at this site. A traditional campsite was the stage for a canoe/kayak portage relay race. Given a list of objects to find, campers worked in groups to portage and collect camping necessities in a race against the clock. Units prepared a modern day cobbler dessert. This easy, tasty treat was a dehydrated food packaged specifically for camping and was a big hit after their successful portage! A step back to the Traders and Trappers brought everyone face-to-face with a black bear, wolf and coyote! Beautiful preserved wildlife pelts and rug were loaned to twilight Camp by a private party and the Voyageurs National Park education trunk was on display. Hudson Bay blankets, a beaver top hat and other authentic artifacts were available for all to enjoy.Dream catchers no doubt were busy at work after each day at the Voyageurs site. Each camper was able to hand make a unique dream catcher. The beautiful works of art truly paid respect to the Native American’s from the Voyageurs area of northern Minnesota. The beauty of California’s Yosemite National Park was brought to life at Site 2 at Twilight Camp. Learning about Yosemite was an eye opener for many campers. Logging was once a danger to the majestic Sequoia trees in the park. Tree heights were marked out show campers the enormity of the beautiful redwoods, and everyone learned about the lumberjacks and the logging industry and were able to use a huge antique saw to really put some muscle into cutting a log. 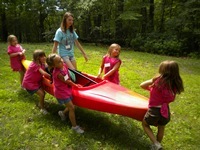 There was also a logging relay race and the team competition brought out the best in the campers. John Muir was inspired by the beauty of the park so much that even today he is called the “Father of the National Parks System”. Muir began the Sierra Club and his writings and works are still popular today with historians, naturalists and park lovers. Each camper received their own nature journal pocket notebook to record their thoughts or sketches while visiting the national parks at camp. Muir also inspired the Yosemite snack area. For Muir on an adventure in the parks, sourdough bread was easy to transport and easy to make with the “sponge” of starter one could carry along for future baking. Sourdough bread and an Orange Julius drink were enjoyed by all. The Orange Julius was invented by Julius Freed, another Californian. Another famous artist, Ansel Adams, provided beautiful black and white photography. Still popular today, the art of Adams was discussed and viewed on large framed posters at the site. Each individual received a postcard depicting a photograph by Ansel Adams. Additionally, a bark rubbed frame was made by each camper. The frame was adorned with a round wooden coin with the Twilight in Our National Parks emblem stamped on it.